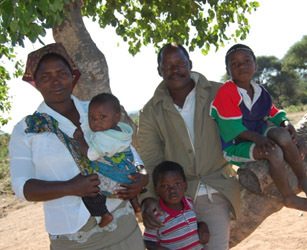 Robert is the chief of Matsilele as well as other villages. He is not only a trusted, well respected and capable chief but also a godly pastor who takes his responsibility seriously. He brings much wisdom to the table in helping to lead his church as well as giving guidance to the other pastors in the villages we work amongst in Mozambique. Once we arrived unexpectedly at his home to find that he was teaching the men from his church the Scriptures sitting under a tree. Many teams have commented during or after being in Matsilele that this church is well organised and the people in the church better versed in Scriptures than in other villages they have been to. Robert make use of every opportunity, even in his official capacity as chief, to encourage others and share Christ when going around to other villages. He came to us a few years ago to come and help in a village close by, Mbeti, where he has started a new church. Pray that Robert will continue to faithfully serve the Lord in Mozambique. Copyright © 2013. All Rights Reserved. | Designed by Pixelstack.